Temporary bridge over the Nolin River built and used by Negley's Brigade to move south. Rain and snow for a few days straight meant that the 79th Pennsylvania's new home, Camp Negley, would be nowhere near as comfortable as Camp Nevin. On December 2, both of the correspondents of the Inquirer wrote back to Lancaster. While "Ipse Dixit" simply added a quick note to go along with his letter of November 24, "Judge" O.C.M. Caines of the regimental band gave a lengthy account of the 79th Pennsylvania and the muck and mud in which it camped. Now what could be the object of going through so much to arrive at so little, as the school boy said when flogged into the learning of his A B C, I cannot say, unless it was to verify the soubriquet of the Southern Chivalry, that we are Mudsills, for this is the dirtiest spot of any we have yet occupied or ever will, I hope. In all social systems there must be a class to do the menial duties, to perform the drudgery of life. That is, a class requiring but a low order of intellect and but little skill. Its requisites are vigor, docility, fidelity. Such a class you must have, or you would not have that other class which leads progress, civilization, and refinement. It constitutes the very mud-sill of society and of political government; and you might as well attempt to build a house in the air, as to build either the one or the other, except on this mud-sill. Fortunately for the South, she found a race adapted to that purpose to her hand. A race inferior to her own, but eminently qualified in temper, in vigor, in docility, in capacity to stand the climate, to answer all her purposes. We use them for our purpose, and call them slaves. We found them slaves by the common "consent of mankind," which, according to Cicero, "lex naturae est." The highest proof of what is Nature's law. We are old-fashioned at the South yet; slave is a word discarded now by "ears polite;" I will not characterize that class at the North by that term; but you have it; it is there; it is everywhere; it is eternal. Showing their literacy in antebellum politics and antipathy for "the South" as they understand it, many mud-encrusted Northern soldiers in the Western Theater adopted the derogatory term and called themselves mudsills with pride. One soldier of the 21st Wisconsin who fought alongside the 79th Pennsylvania at the Battle of Perryville even entitled his memoir Memoirs of a Dutch Mudsill. Since my last letter we have moved about one and a half miles forward from our old camp. The surgeon has "appropriated" an empty house, formerly occupied by a secesher, for the use of the sick. Camp Negley, Nolin, Hardin co., Ky.
Mr. Editor: I received your very acceptable Inquirer of the 23rd ult., with much pleasure, except the orders, but as I am among the soldiers, I must obey. As the old sailor remarked to a passenger, on board ship, in a calm, when he called on old Boreas to blow. Yes, yes it is easy to say blow, but where is the wind to come from; so it is with me, what am I to write about. We have no news, except what we receive from our friends at home, and it seems as if you all know more about the movements of the rebels in Kentucky and Tennessee, than we do here. We were very comfortably fixed at camp Nevin, many of the boys having their tents floored over, some with old boards, others with fence rails; but mostly with young saplings, and some were warmed with underground flues, constructed in the most primitive style, with short cuts of saplings, plastered with mud. We had also constructed a bake oven, equal in size to any in Lancaster, with bricks obtained by tearing down the chimney of a new house, in the village of Nolin, that belonged to Captain in the rebel army. The regimental bakers, are Herman Gercke, Adam Ripple and George Fordney, the fruit of their labor was most excellent. Another advantage of the oven was, that to those who could afford it, and watched the chances, a roast pig, turkey, or rabbit pot pit, &c, would grace their tables, and tickle the palates of their invited friends--of course I got my full share. But alas, a change came o'er the spirit of our dram of future comfort, for on last Tuesday morning, the orders were given to strike tents and march, which feat we accomplished about noon. After crossing Bacon creek [I think he might mean Nolin River], on a bridge of felled trees, covered with fence rails, straw and dirt, gotten up for this special occasion at very little expense to management, and for that day only, as they say on the theatre bills, (a freshet washed it away that night) we arrived our present location, a distance of about 2 1/2 miles south west of our old camp. Now what could be the object of going through so much to arrive at so little, as the school boy said when flogged into the learning of his A B C, I cannot say, unless it was to verify the soubriquet of the Southern Chivalry, that we are Mudsills, for this is the dirtiest spot of any we have yet occupied or ever will, I hope. Mudsills indeed had you seen me yesterday trying to navigate the various posts between the islands of tough clay, you would have thought I was a mud sprout, wading through one and sticking fast in the other. How long we are to remain here I know not, for as the contraband preacher said to his congregation, "while man [out of focus]." On Tuesday night it rained with a perfect disregard to our comfort, and has either rained or snowed every day since. We have now, about three inches of snow on the ground, and that upon a soft bottom makes regimental drills, guard mounts, &c., rather a more [out of focus], than pleasant exercise. The health of the men continues to be very good, there being but eleven on the sick list to day, which you must admit is a very small per centage of 984 men. My quarters are located in a piece of open woodland, about two acres of which were cut down, for the formation of the camp. The three companies on the right of the regiment are equally fortunate, but after that the old corn field commences, and the left is on the verge of the swamp I alluded to. Messrs. Taylor and Hartman, our Sutlers, arrived in camp on Friday last, both looking well. The distributed a number of letters and packages that had been entrusted to their care. All of their goods have not yet come to hand, owing to various delays, among others the loss of a long bridge between this and Louisville, destroyed by the late freshet. To day they pitched their tent, and will commence business to-morrow, with the stock on hand; their arrival has been anxiously looked for, and they were cordially welcomed. In regard to the numerous inquiries about the camp regulations, and the changes reported to have been made in our regiment, I pronounce the whole of them false. The men of the regiment are not opposed to the Colonel, but on the contrary they pride them selves, not only on having the Colonel not only of the Brigade, but of the Division--That he is a martinet and strict disciplinarian, we all knew before we left home, or joined his command; and his being so has made us (what is conceded by General Negley and others of his rank,) the best drilled and most reliable regiment in the camp, taking in account the very short time we have been in the field. And I believe the men would and will follow him to the battle field with the confidence of victory. As a proof of it you read in the Express that an exchange of companies was to be made, by turning over Capt. McBride's Alegheny company to Col. Stambaugh, so as to make room for Cap. Pyfer's company, fifty of whom have arrived in camp with the captain. McBride's company to a man swear they will not be exchanged, as they went to serve under Hambright, as they have confidence in his ability and courage. What disposition will be made of Pyfer's men is not yet settled. The General and his officers speak of making twelve companies in our regiment, giving us the artillery and Capt. Pyfer. It looks something like it, as they moved their stables to the field in our rear. There was a slight misunderstanding as to the colors. The Colonel was right--the governor making the mistake at the presentation; but there was no ill feeling--on the contrary, General Negley presented the Regiment with a most splendid blue silk flag,--with the national coat of arms, and again our Regiment retains the right of the Brigade on all general parades. To show still farther the good feeling existing, when Gen. Negley left camp for Louisville, Hambright had full command as acting Brigadier General until his return. As to the reports of Captains Gumpf's and Whitesides's removal, they are equally as false. The truth is some men may make good school teachers and scribblers, but poor soldiers--more fond of seeing themselves and morbid ideas in print, than showing their dainty bodies on the field learning their duty as soldiers and not to meddle with the affairs of their superiors. Thanks for the comment. I was definitely confused by that part, so I took a guess that Caines got confused and meant Nolin River instead of Bacon Creek. On the November 26 march which Caines was describing, I think the regiment went a little north, then west, then a little south to get to Camp Negley. So I don't think there would have been any opportunity at this point to get any farther south than that. Plus, the bridge matches the description of what the 77th Pennsylvania built over the Nolin River, as sketched by an artist from Frank Leslie's Illustrated. 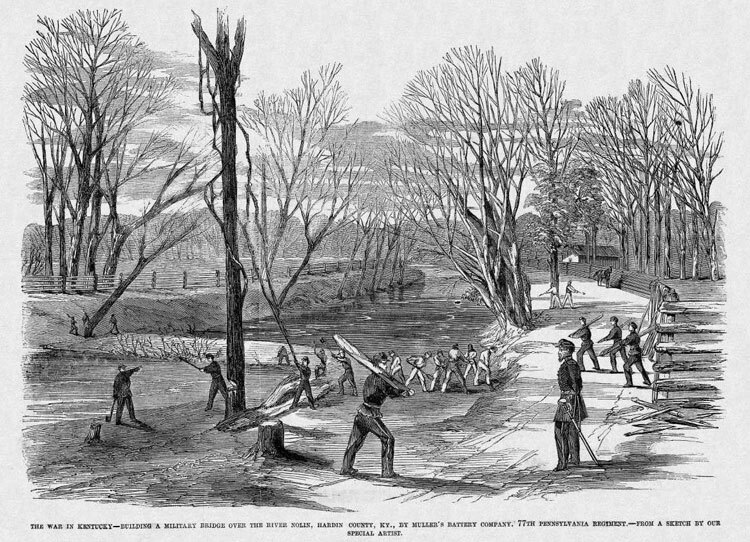 On December 11, then, the regiment marched down the Louisville-Nashville turnpike to the Bacon Creek. Do you see many remnants or signs of Civil War operations in your area? Interesting. Thanks again for the comment, and please do so in the future if you have anything to add about what the sites mentioned in the blog look like 150 years later.